Farmers get to know more about ag brands; ag marketers learn more about their customers. Facebook Live has emerged as a great marketing tool for brands and customers to connect, especially for ag events. Facebook may not have had farmers in mind when it created Facebook Live, but it’s a perfect social media channel for ag brands, companies and organizations to connect with farmers. Farmers can’t make it to every plot tour, demo, farm show or customer event because of their many farm responsibilities. That’s where a Facebook Live can help farmers – or even their farm team – get the latest on weed or disease management, equipment or new products even though they can’t be at the actual event. Besides letting farmers watch and learn, Facebook Live brings a lot more to the table…more engagement, more content, more video and more data. Not to mention that it’s budget friendly. Facebook Live is not just live-streaming. Yes, Facebook Live allows you to share live video with farmers, but it does more than just that. It truly allows you to personally connect with your audience. You can engage farmers, and they can engage with you. Effective Facebook Live events invite questions and conversations from farmers. This lets ag brands and farmers get to know one another better. For instance, agronomists can share what they see while scouting a field. They could offer solutions to an emerging disease, but also invite farmers to ask questions about their specific operation. And anyone within a company or organization can be your Facebook Live host, from a sales rep to a vet or researcher, to the CEO. And if they do enough Facebook Live events, they can become the face of your brand; the recognizable face your farmers can connect with and trust. 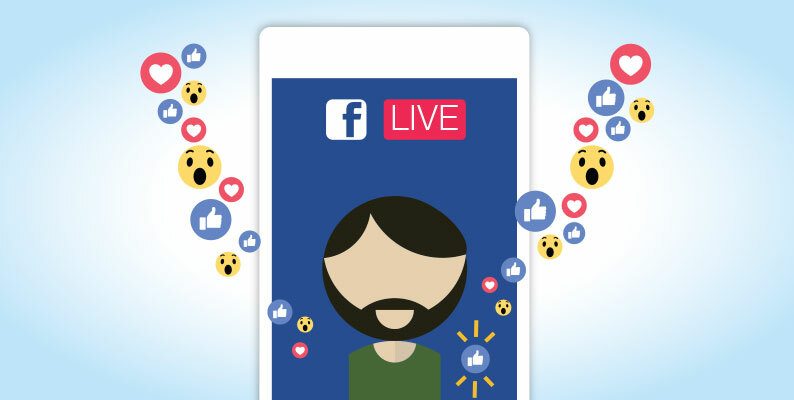 Your Facebook Live event can evolve into multiple content opportunities. Comments and questions could become topics of future Facebook Live events. And the list of topics is endless in agriculture: field days, panel discussions, customer appreciation events, farm shows, field scouting, weather, crop conditions, equipment demos, product launches, research, quarterly reports, annual meetings, trade shows, planting, spraying, harvest … the list could go on and on. Just because it’s called Facebook Live doesn’t mean the content expires after the live event. Repurpose your Facebook Live content. Post it on your website. Promote it through your social networks. Link to it often, especially if it relates to frequent agronomic, mechanical or animal health issues. Video has quickly become a preferred form of content for many farmers, especially the younger generations of farmers. Facebook Live is a great way to reach this next generation of on-farm decision-makers. A timely Facebook Live event with a University Extension agent gives farmers an opportunity to find out how to deal with an emerging issue in their local area. The brand promotes the Facebook Live event to their followers, while the University or Extension office promotes their participation. Then followers can share the event details or video. At the end of the day, you have more video content, which is what your audience is looking for, and it subtlety enhances your brand’s credibility as an expert in this area. We all know the power of the data we get from Facebook and how we use it to reach farmers. Through Facebook Live, you capture even more vital engagement and customer data – in real time. Just think how valuable it would be to get immediate feedback from farmers about a new product or service you are launching. Then you can take this data (or feedback) and turn it into an insight to better target farmers with timely, customizable content. And most importantly, don’t forget to set a Facebook Live goal that you can measure. Conducting a Facebook Live event doesn’t require a large financial commitment. All you need to start is a quality smart phone or tablet with a camera, a reliable internet connection and a Facebook account. The start-up costs will be low, but so might the production value. And then Facebook Live is scalable for any ag event, whether out in a field at farm show or in a large auditorium. You can choose how much or little technology you need depending on the ag event. Remember the purpose of hosting a Facebook Live event is for your ag brand to connect with farmers. Sure, you want it to lead to more sales. But if you can create Facebook Live events that truly engage with farmers, then you both win because you have a better relationship with each other. I love the idea of going live on Facebook. Do you suggest posting a few days before you go live saying when and why you will be going live? I have read before to let people know when you will go live so they will tune into the event.